In a previous blog post about Latent Semantic Indexing, we talked about how you can generate a list of linked keywords that can be used to optimise a piece of content to achieve top search engine rankings. A quick recap, say you have a page about coffee mugs. For Google – and other search engines – to understand that your webpage is about coffee mugs it will look at the content of the page, identify keywords and phrases and use these words to understand what the webpage is about. The better a search engine understands a webpage, the more it trusts its content and the higher it’ll place the webpage on its search engine results pages (SERPs). With all this talk of keywords and automatic identification, it’s important not to lose sight of the fact that content is meant to be read and that you shouldn’t sacrifice quality for keywords. Indeed, those who do insist on stuffing their content with SEO keywords will find their content marked as a piece of black hat SEO. If Google suspects a webpage of doing this it will penalise it – removing it from the search results entirely. At Creative Insight we use a piece of software developed by a well-respected internet marketeer and SEO expert, to help with our content theming process. We use the program to generate keyword and phrase lists, as well as keep track of how often they have been used in a piece of writing. 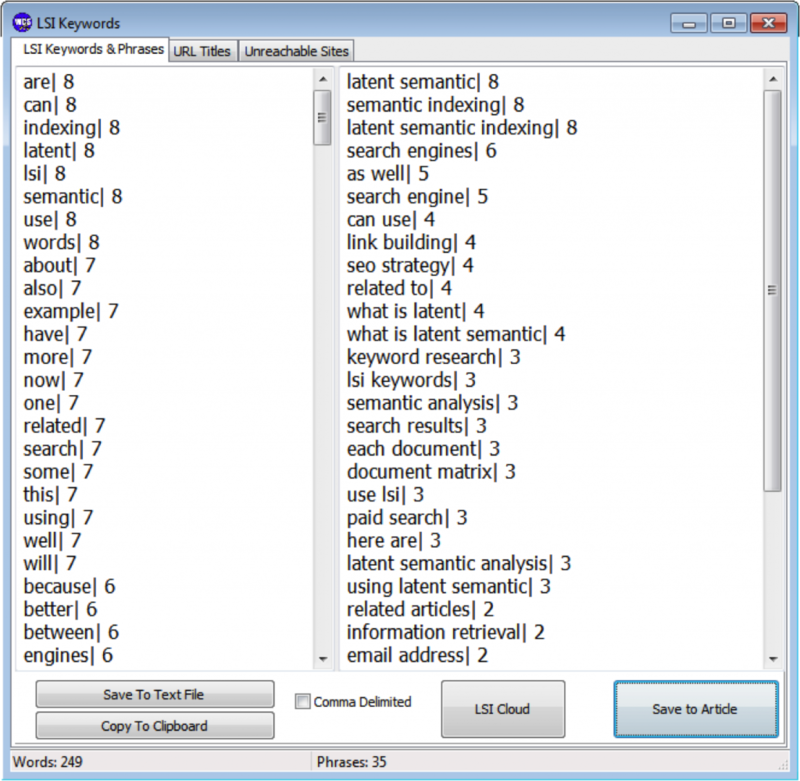 The lists generated by the software examine all of the top ranked pages for any given keyword or phrase on Google and looks for commonalities in both word and phrase usage. The resulting lists thus represent the words that Google identifies as being linked to this topic. Simply put, if these pages are all ranked highly and all share certain keywords and phrases – these are part of what makes Google value these pages. Once we have our lists we can work these words into our content in a natural fashion. While writing the article within the software, we can check how well we have balanced our keywords and phrases to the rest of our content using the inbuilt reports. 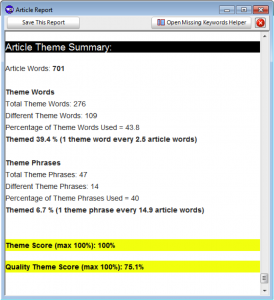 The Theme Score indicates how many keywords and phrases we have included. Improving this score is a simple case of adding more of our keywords. Quality Score, however, is slightly more difficult. This score calculates the quality of the content and whether the piece appears “over optimised” – something that may trigger black hat SEO penalties from Google. Using content theming techniques we have achieved incredible results for our clients. As an example, we used this process to create themed content for a popular long tail keyword for one of our leisure sector clients. Out of a competing 2.2 million results – after our content theming work – our client’s page rose to the number one spot after just one week of going live.